I hope you all had a great holiday weekend. I'm trying to squeeze as much work as I can before the end of 2010, as I'll be going to Hong Kong for a couple weeks right after the New Year. One thing I'm attending to on my list: a review of Tate's Bake Shop cookies and cookbook. I was sent a package of cookies from the famous Tate's Bake Shop, Kathleen King's bakery in the Hamptons, along with her new cookbook that captures many of the signature items from her shop. Read on to find out how you can win a package of her cookies and the cookbook as well! Kathleen King has been baking since she was a child, and she has run Tate's Bake Shop in Southampton, New York, for over 25 years. The menu is a comforting mix of homey selections, from blueberry muffins to rhubarb cobblers to sour cream coffee cakes. Shortly after King opened her bakery, Ina Garten, the Barefoot Contessa, began carrying her products and is one of her biggest fans. 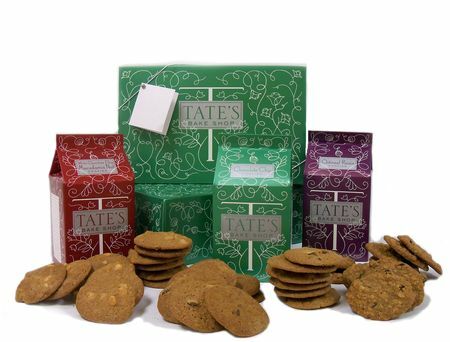 The package I received included Tate's signature chocolate chip cookies, along with their oatmeal raisin and white chocolate chip macadamia cookies. These cookies have my favorite texture: thin, crisp on the edges but chewy in the center. They are made with no preservatives, and so are meant to be enjoyed quickly, or you can freeze them and bring them out for emergency munchies. These cookies are pretty straightforward-tasty in a classic, no frills way. The cookbook is similar – clean, simple renditions of many bakery mainstays that you'd like to have on hand in your own kitchen- poundcakes, crumbles, fruit tarts, chocolate cake. I do recommend trying the chocolate chip cookie recipe first – there's always room for more good chocolate chip cookies in the world. 1. Follow me on Twitter and leave a comment below letting me know you've done so. (If you already follow me, thanks! just leave a comment). 2. You can also follow Tate's Bake Shop on Facebook for an additional entry. Let me know if you've done so in your comment. 3. I'll take entries up until December 31st and announce the winner on Monday, January 3rd. 4. Also, use the code "cookie" at Tate's Bake Shop for 15% off your order through December 31st. 5. This giveaway is open to U.S. residents only. Thanks and good luck! Hope you are enjoying the holidays! Just follow Take’s Bake Shop on Facebook! Just followed you on twitter, thanks for the giveaway! I’m following you on twitter (@cupcake_muffin). These cookies are super yummy! I follow Tate’s on Facebook! And following you on twitter! Alas, I don’t do Twitter, but already follow Tate’s Bakeshop on Facebook! Would still love to win! Just “Liked” your page on FB as well! I am a fan of Tate’s on facebook. I LOVE these cookies! Whenever I drive by the factory, its like I dies and went to heaven! I’m a FB fan of Tates. Merry Christmas and Happy New Year, Anita! I already follow you on Twitter, so count me in! I’m a Tate’s follower on facebook. I want this book!!!!!! new twitter follower micaela6955 have a great New Year! I’m a fan of Tate’s on fb. I follow you on Twitter (@SheLikesRuffles)! I am a facebook fan of Tates! Just followed you on Twitter – would love this giveaway. I am a fan of Tate’s on FB – thanks! I am following you on Twitter – thanks for the cookie giveaway! Following you on Twitter now! Thanks for the fun giveaway idea! I’m a Tate’s follower on facebook. 3 1/2 years ago, but I just found it and am in the middle of making it – and I got down to “1/2 cup (8 1/2 fl oz) milk”. Is it supposed to be 1/2 cup (which is 4 fl. oz.) or 8 1/2 fl. oz. ??? I’ve been following you on twitter. Thanks for this giveaway. Thanks for the catch! It is supposed to be 1/2 cup or 4 1/4 ounces of milk. I’ve made the correction to the post. thanks again! I love reading reviews about food, restaurant, bakery, recipe etc. And it is really important to know where to go best for our food need, right?